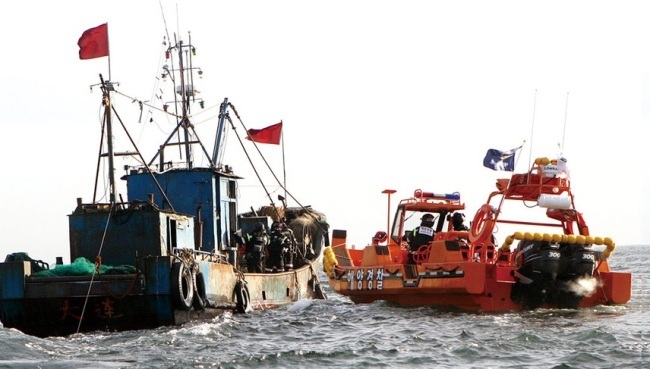 South Korea and China will resume their joint patrols on illegal fishing activities in the Yellow Sea, some two years after a deadly clash between Korean authorities and Chinese fishermen, Seoul's oceans ministry said Tuesday. Fisheries authorities will conduct joint rounds of inspections in the provisional water zones in the Yellow Sea, an area of positive collaboration between the Asian neighbors, until Nov. 26, the Ministry of Oceans and Fisheries said. The joint patrol has been suspended since the Korea Coast Guard used force to secure a Chinese vessel fishing illegally in Korean waters near Incheon in September 2016. The incident resulted in three Chinese fishermen accidentally dying from smoke inhalation. Each country's coast guard personnel will monitor operations by unregistered ships, violations of territorial waters and obstruction of official duties in the exclusive economic zones, the ministry said.